Inspired by these valuable quotations, this renowned institution was established by the far-sighted ancestors, on the felt need of the society in our Home Town. PSC is a renowned CBSE school located on the outskirts of vibrant town and is uniquely designed to provide “Standardised Education” to girls. It caters to the needs of the first generation of women learners. 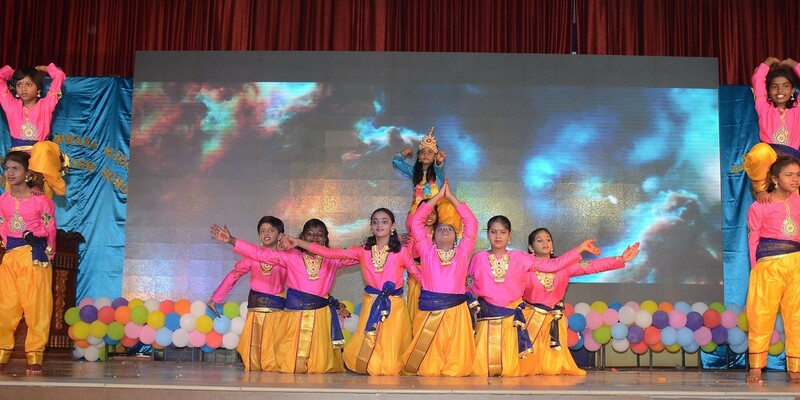 It is highly dedicated to the pursuits of Academic Excellence, Sports Achievements, encouraging students to become independent and perception thinkers confident and enlightened learners, socially responsible citizens with a mindset that can both interact and integrate effectively with people of different culture. Though the Academic excellence is our major thrust, we prepare them to face the challenges of tomorrow and encourage them to show case their talent and grow to their full potential and constantly groom them to pass out as women competent to bear responsibility in all walks of life. I’ m happy that PSC is marching ahead into the advancement of world providing best education since its inception in 1975. The growth of the institution within the span of 42 years is really amazing. The school’s achievements from its inception to fruition and till today have been nothing but exemplary and extremely gratifying. The Management has provided the magnificent infrastructure with Hi-tech facilities to impart holistic education without discrimination. The school campus is recognized for the hallmark initiatives in educational excellence, environment conservation, peace and value-based education. 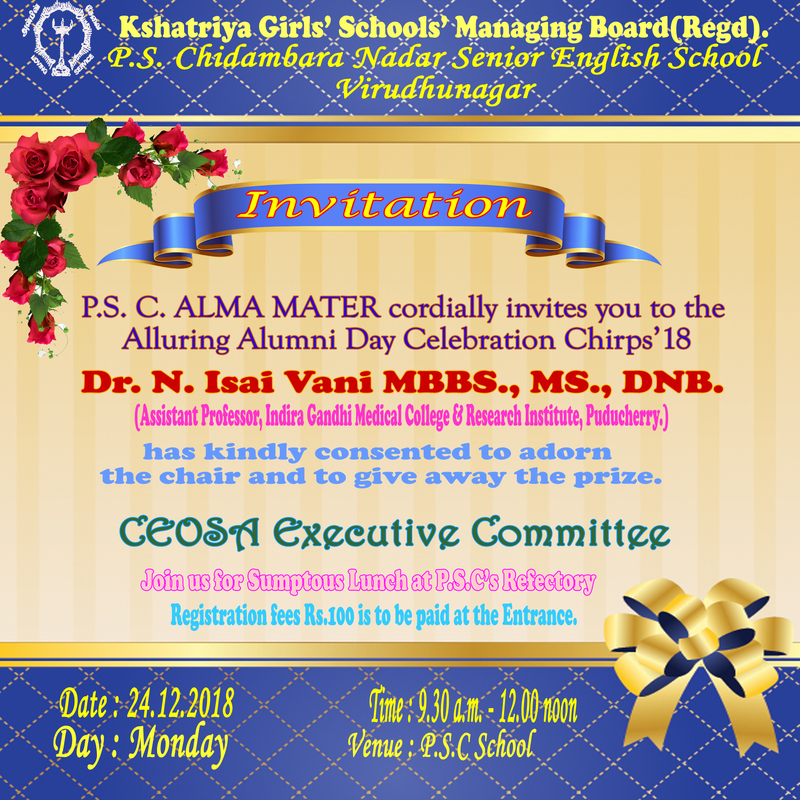 We are offering the best service to the students who have stepped into our portals as ‘SMART KIDS’ to step out as “Dazzling Damsels”. 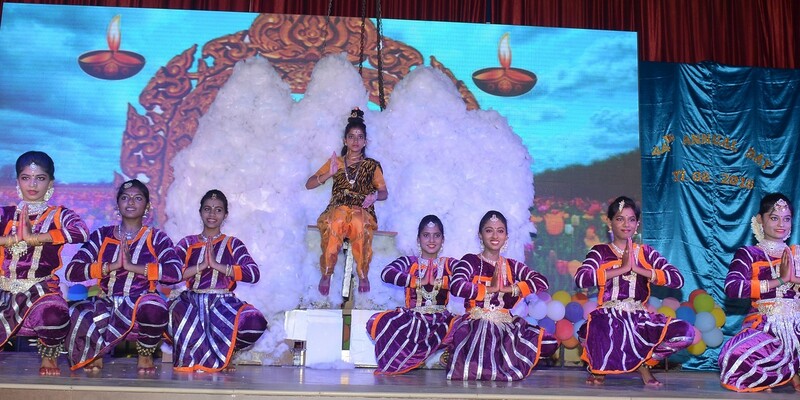 We provide a vibrant and supportive ambiences to mould the chidambarettes into excellent and extraordinary academic achievers and sports stars and this helps us to make strides in Academic pursuits and sports performance. Today we are providing a “Beacon of Light” to many outstanding chidambarettes. Many of PSC’s precious Alumni have added colourful feathers to PSC’s cap by emerging as Best Administrators, Doctors. Engineers and Lecturers The school Motto “Loving Service” inspires them to render yeomen service and they prove to be the valuable contributory assets to the development of the organizations they serve as well as to the nation. They make their Alma Mater a hallmark of Discipline which treads towards the Zenith of glory. May God bless the Board Exam students of this year to score high marks and to emerge as meritorious Achievers in State Rank and National Rank! I am confident that senior chidambarettes will achieve and engrave their name in “Letters of gold” in the school annals and make us cherish all the glory they leave behind. May God’s divine benevolence shower upon our prestigious institution to flourish well in Academics and Sports and to become a “Beacon of Hope, guidance and glory” to all who pass through its Halls of learning! 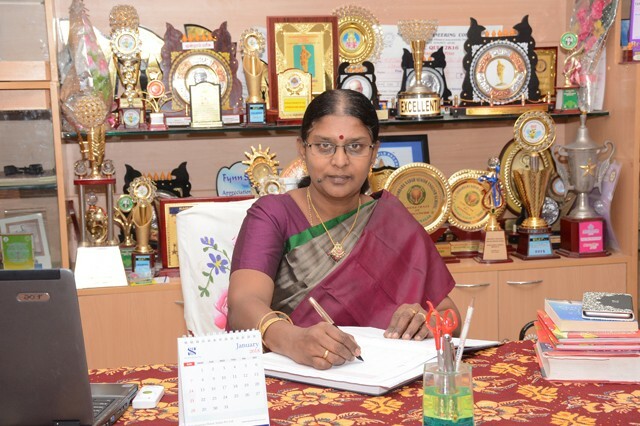 I am greatly privileged to be the principal of an outstanding renowned CBSE School (PSC School) in the Birth place of Noble leader Thiru K. Kamaraj and consider myself lucky to render my dedicated service amidst the triumphant team of Magnanimous Management, dedicated staff and meticulous students who strive, together and come up with brilliant record in every field. 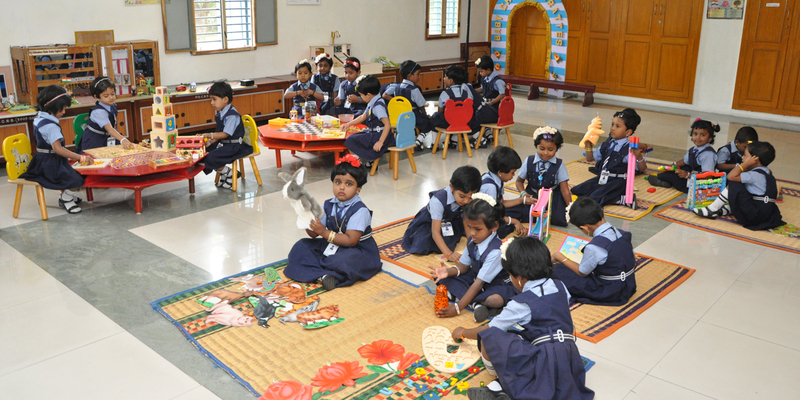 PSC School always aims at the holistic development of each and every student. Imparting knowledge is not its sole motto but it takes earnest steps to bring up the student physically fit, socially adjustable, emotionally stable and mentally balanced so that she could emerge as the successful personality to suit the current needs of the society. From the very inception of the school, the management is keen in giving greater emphasis on the qualitative aspect of value based Education and dexterously designs the infrastructure to suit the current needs. The curriculum and the innovative teaching methodology is always in tune with the global trends undoubtedly PSC School always paves the smooth path to the pinnacle of glory and carves an enviable niche in the field of Education. 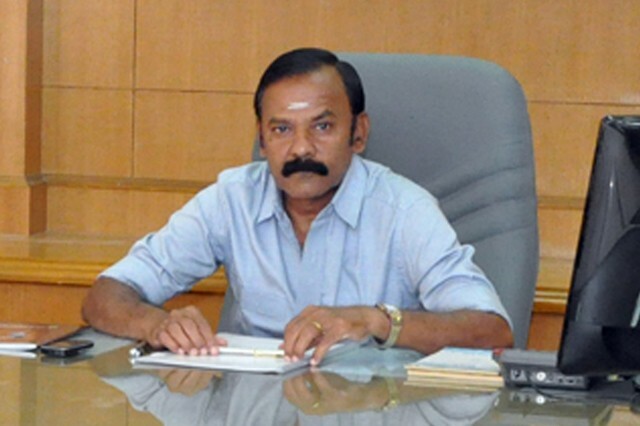 It stones as an exemplary full fledged institution to the newly springing up schools and aptly suits to the famous. Quote of Rabindranath Tagore, the noble laureate.